These are probably the most "delicate" things I bake, and for that reason I don't bother freezing. 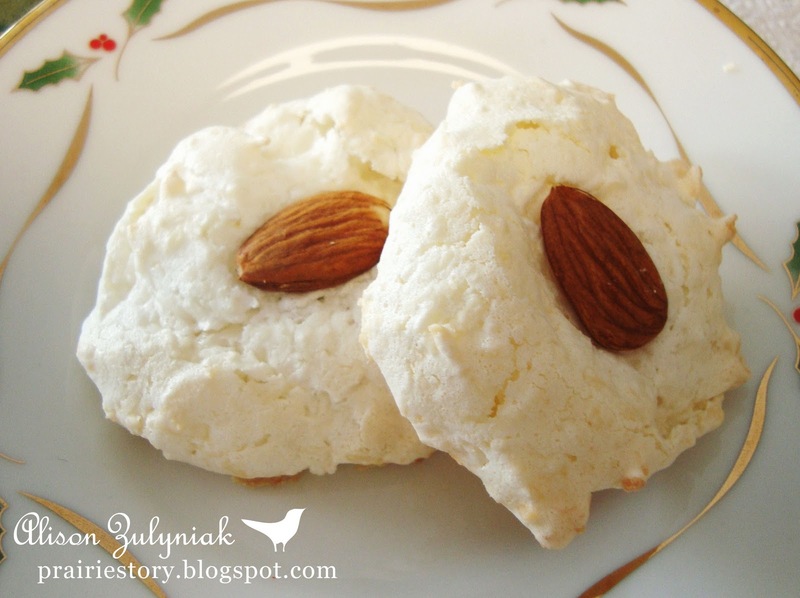 They are a cross between a macaroon and meringue; regardless they are one of my favorites because the have two things that I love - coconut and almonds. - Beat egg whites in bowl until soft peaks form. Gradually add sugar, beating until glossy peaks form. - Fold in coconut and almond extract. Chill for at least 30 minutes. - Grease and flour 2 baking sheets. - Drop macaroon mixture onto sheets and top each with a whole almond. - Bake @ 325° for 18-20 minutes. These look so crispy and good. It looks like an icing topped with an almond. This sounds yummy, I love macaroons but the ones we usually have here are the soft and chewy type. This sounds different because it looks crunchy.